BLEASDALE, or Admarsh, a chapelry in Lancaster parish, Lancashire; among the hills, 5 miles ENE of Garstang r. station. It has a post office, of the name of Bleasdale, under Garstang. Acres, 8,490. Real property, £2,418. Pop., 372. Houses, 52. Most of the area was formerly forest, belonging to the Crown. Bleasdale Tower is the seat of W. J Garnett, Esq. Bleasdale Fell is 1,709 feet high. The living is a p. curacy in the diocese of Manchester. Value, £80. * Patron, the Vicar of Lancaster. The church was built in 1837. There are an endowed school, a reformatory, and charities £44. Local studies information is held at Garstang library. Details about the census records, and indexes for Bleasdale. You can also perform a more selective search for churches in the Bleasdale area or see them printed on a map. The Register Office covering the Bleasdale area is Lancaster. Ask for a calculation of the distance from Bleasdale to another place. "ADMARSH, (or Bleasdale), a chapelry in the parish of Lancaster, hundred of Lonsdale, in the county palatine of Lancaster. Garston is the post town. It is a curacy, value £80, in the diocese of Manchester, and in the patronage of the vicar of Lancaster." "BLEASDALE, a chapelry in the parish of Lancaster, hundred of Amounderness, in the county palatine of Lancaster, 4 miles to the E. of Garstang. This township consists of an extensive tract of elevated moorland, rising at Calder Fell, the highest point, to the height of above 1,700 feet. It formerly constituted the Forest of Bleasdale, but is now almost entirely enclosed. The living is a perpetual curacy in the diocese of Manchester, of the value of £80, in the patronage of the Vicar of Lancaster. The charitable endowments of the township amount to £66 per annum, the produce of a bequest by Christopher Parkinson, in 1702, and which is applied partly to the support of a school and partly to the relief of the poor." In 1835 Bleasdale was a township in the parish of Lancaster. 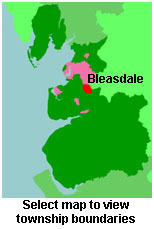 You can see the administrative areas in which Bleasdale has been placed at times in the past. Select one to see a link to a map of that particular area. View maps of Bleasdale and places within its boundaries. For probate purposes prior to 1858, Bleasdale was in the Archdeaconry of Richmond, in the Diocese of Chester. The original Lancashire wills for the Archdeaconry of Richmond are held at the Lancashire Record Office.